The 19th Undergraduate Senate (FEBE MARTINEZ/The Stanford Daily). On Tuesday night, the Undergraduate Senate condemned Stanford College Republicans (SCR) for hosting Robert Spencer at an ASSU-financed event but did not revoke its funding. The 19th Undergraduate Senate will still fund the College Republicans event (FEBE MARTINEZ/The Stanford Daily). Spencer, who co-founded Stop Islamization of America and the American Freedom Defense Initiative, will be speaking at Stanford on Nov. 14 by invitation from SCR. Some students have opposed Spencer’s visit due to his Islamophobic views – an online petition to defund the event has been circulating via email, while an unknown individual tore down posters and flyers advertising the event in a campus dormitory over the weekend. 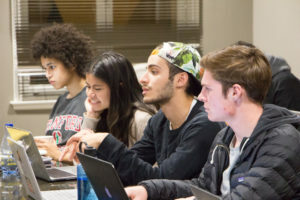 The Senate cited to its Mission Statement, which states that the Senate is responsible for appropriating funding to over five hundred voluntary student organizations that in turn provide the majority of programming for the entire campus. It also said that it must act in compliance with Supreme Court decisions, federal law and California statutes regarding the protection of free speech on college campuses when making decisions – including stipulations that prevent the preemptive censoring of speech. Caleb Smith ’17 M.A. ’18, a Daily news staffer who authored the petition against the event, urged the Senate to reconsider its decision to continue to fund the event. Smith added that the Senate “already exercises considerable discretionary authority over how its funds are spent” on a day-to-day basis. Senate Chair Kojoh Atta ’20 thanked Smith for his concern but responded that the Senate could not amend their statement. The Senate emphasized that it is responsible for the funding – not planning – of events and that the nature of the events are curated by the student groups that hold them. Additionally, the ultimate decision to allow or disallow events on university property belongs to Stanford administrators. “If you were to take back your student funds, you unfortunately would not be able to take back the funds that went to Robert Spencer,” Student Life committee chair Lizzie Ford ’20 added. Despite its decision to continue funding the event, the Senate, in its joint resolution with the Graduate Student Council, officially condemned the SCR’s decision to invite Spencer. Senate reaffirmed that it will continue to support all student groups equally, and that all Muslim students are valued members of the Stanford community. Advocacy committee chair Hamzeh Daoud ’20 made a final comment on the Robert Spencer event, voicing his own experience as a Muslim. Daoud concluded by reaffirming his pride in his Muslim identity and community. Contact Felicia Hou at fhou‘at’ stanford.edu. This piece has been updated to remove potentially identifying information about a student who felt threatened after some of his personal information was spread elsewhere online.